Internationally-renowned violinist Moshe Hammer, the driving force behind The Hammer Band, recalls: “During the ‘Summer of the Gun’ in Toronto (2005), I was preoccupied with the sad fact that young people – even pre-teens – carry arms regularly and sometimes use them. The Hammer Band is a charitable organization that started with an idea in 2006, as renowned violinist’s Moshe Hammer’s response to Toronto’s tragic “summer of the gun.” Believing in the power of music and music instruction to help children of diverse backgrounds from at-risk neighbourhoods to “change their tune,” he walked into a public school in the Jane/Finch corridor during early 2007 and offered to teach there, in venues that are known, safe and secure for the children. That year saw two schools with 40 youngsters participating. Today, with the help of other professional musicians to teach the students, The Hammer Band is in 40 schools reaching more than 1000 children in grades 4 through high school. We have also started master classes for smaller groups of promising and talented players, who benefit from more individualized instruction. In the year 2018, The Hammer Band has extended its reach to support 42 schools and over 1000 students in the GTA! In September 2015 The Hammer Band added more schools bringing our total number of schools to 35 and music instruction to over 700 students! In September 2013 The Hammer Band adds another five schools to reach a total of 23 schools and over 500 students. January of 2014 sees The Hammer Band in discussions with three schools in the Peel District School Board. Classes are scheduled to begin in February. The Hammer Band program ran in 18 schools, teaching lessons to 400 students. On May 22nd, The Hammer Band held “Follow the Beat – Join the Band” at Integral House and raised funds to support the program. A talented group of children played to an appreciative audience in a spectacular setting. 150 of The Hammer Band kids take the stage at Koerner Hall on June 19th as the opening act for Moses Znaimer’s annual ideacity conference. The Hammer Band is featured on etalk as TD Musicounts, a supporter of the program, visits a class at Oakdale Park Middle School. On November 10, Moshe Hammer, the Executive and Artistic Director of The Hammer Band received the Tikun Olam Award for outstanding achievement in Education at the Starry Nights Gala held by Ve’ahavta. Margaret Wente of the Globe & Mail lists The Hammer Band as a charity that manages, “to do a lot with very little” in an article entitled, “Eight charities that deserve your cheer”. 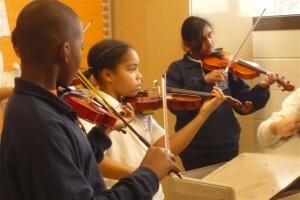 The Hammer Band program ran in 15 schools, teaching music lessons to 300 students. Many of the students continued on from the instruction they received in previous years. The cello was introduced to students for the first time. On April 25th, 2012 The Hammer Band’s ‘All Schools’ Concert brought over 150 students together to perform for family, friends and the community at Brookview Middle School. The event was filmed by Melissa Dozois who has created a documentary about The Hammer Band Program. ‘The Hammer Band’ was celebrated at the Business for the Arts event at Telus House in June. Students performed for representatives from major Arts and Business organizations based in Toronto. A total of 45 students attended two summer Camps at Topcliff Public and George Webster Elementary schools. They were taught music lessons as well as participating in activities with special guests Yosvani Castaneda and Marilyn Lightstone. The Hammer Band students performed at the Harbourfront Centre in downtown Toronto on July 29th, to enthusiastic crowds who were delighted to learn about the program and it’s goal to prevent violence through violin lessons. In August, 201l, the Miles Nadal Jewish Community Centre (MNJCC) named The Hammer Band as one of their Tikkun Olam (Repairing the World) community partners. Media highlights during the school year were: a December, 2010, CBC-TV Toronto News story, with subsequent coverage on CBC-Radio; a Toronto Star feature article on the concert and the organization; an article on Homemakers magazine blog and an interview in three languages on Radio-Canada International, as well as coverage on a local fundraising event in a community newspaper. The “Get Involved” organization made a documentary on Moshe Hammer and The Hammer Band as part of its series on inspirational people and ideas making a difference in their communities. It aired on TVO’s companion show in the fall of 2010, and online. Steve Paikin, host of TVO’s The Agenda, interviews Mr. Hammer on his show about the program. The Hammer Band starts its From Violence to Violins program in two schools, Derrydown and Braeburn, teaching 40 students on free violins; the year ends with recitals for 500 family members, neighbours and school teachers/principal.